Lego has certainly stepped up in the world in recent years. Branching out to provide movie fans the chance to recreate their favourite scenes in little plastic bricks was an inspired move. 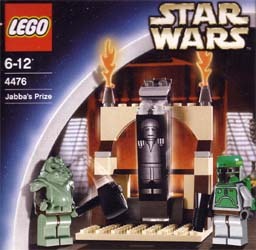 Jabba's Prize is a small kit that is designed to be purchased as an add-on to the larger Lego: Jabba's Palace kit. Jabba's Prize comes equipped with three figures - Han Solo in carbonite, Boba Fett and a Gamorrean guard. While there may not be much to this collection, the Lego version of Boba Fett itself is almost worth the asking price. And if you aren't happy with the tiny play area that is provided here, then you can always make something a bit more elaborate with any other Lego you have lying around - that's the point of Lego isn't it, to construct things out of your own imagination. If you are a real Star Wars fan then you'll be Force-d to buy this.